People by nature hold different moral and cultural preferences, often very deeply so. In a system that enforces the principle that no law is legitimate unless previously voluntarily adopted by the person on whom it is enforced, people holding to different voluntary laws therefore must coexist. These people are not separated from one another by territorial boundaries. Conflicts between people holding to different laws are inevitable, in such systems. If two persons cannot agree on the law to apply in a particular case, or a way to settle disagreement on the applicable law, they are foreclosed from access to the law. Generally accepted “default” conflict of law rules are fundamentally useful, in the absence of any particular agreement on the matter. This chapter discusses some of the possibilities and advocates for one approach to resolving conflicts believed to be optimal in both moral and practical senses. Voluntary law without any universal conflict of law principles is feasible, but would restrict operation of each law to a single society of people who have adopted the same law. The power of voluntary law to expand beyond the narrow scope of traditional private law and eventually displace current collective monopoly forms of governance depends in large part on widespread understanding and acceptance of universal (or “nearly universal”) principles for resolving differences between the voluntary laws brought by parties to a dispute. In addition to conflicts between voluntary laws, conflicts may also arise between voluntary law and state laws. The former type – voluntary law conflicts – are capable of being resolved entirely within voluntary legal systems. The latter type concerns coexistence with state systems, which is a different subject entirely and treated in a different chapter. In a legal system with no territorial authorities, wherein each person is free to choose her own law, is it possible for rules resolving differences between laws to exist that both prevent the imposition of laws on those who reject them, and do not undermine justice? This can be approached as a problem of game theory. Superficially, it might seem that no fair solution could exist. The possibility for unresolved conflicts of law is a stumbling block that might prevent many from considering voluntary law as a viable legal system. But it takes just a little thought to see that the conflict problem in voluntary law can be solved by logical consideration of personal incentives in the context of social behavior. It just requires thinking about law in ways that most people are not accustomed to. The inquiry into a suitable solution begins with the standard of justice. Justice requires reciprocity, meaning that each are judged under the same measure as each would judge others. That whatsoever a person metes out, is meted back. The opposite of reciprocity is hypocrisy. Hypocrisy exists whenever people would apply different rules to the conduct of others than they would apply to their own. Hypocrisy undermines justice. If everybody follows the same law, which is always applied with perfect justice and uniformity, hypocrisy cannot exist. Under an authoritarian system, it can be pretended that the same law is imposed on all. This is a logical solution to hypocrisy, although horribly idealistic and impractical. Those in power are never subject to the same laws they impose on others, either openly by making laws that will never be applied to themselves, or secretly by corruption. In a system of voluntary law societies, the fiction and fantasy of equal justice under one standard law is rejected. Instead, members of voluntary law societies will sometimes face the dilemma of choosing the law to apply in a dispute between persons who hold to conflicting laws, without consideration of any overriding territorial authority contrary to the published voluntary choices of the parties. Under the basic principle of voluntaryism, we must generally apply the defendant’s law to prevent the defendant from being judged by a law she did not adopt. This might be called the principle of “Defendant’s Law.” The claimant has no right to expect that others must follow his law, but only that the defendant should follow the law that she has openly adopted. The requirement to apply the defendant’s law opens the door to opportunistic adoption of law in pursuit of hypocritical ends, by overly clever prospective defendants. For example, a person who owns no property of a certain type may refuse to recognize property of such type held by others, up until the person acquires such property, and which time the person adopts a law respecting the property type. To disincentivize opportunistic adoption of law by persons set on reaping a harvest of hypocrisy, defendant’s rule can be tweaked to impose the most severe law — the “Law of Greatest Liability” — adopted by the defendant at any time since just before the legal complaint at issue first arose. Defendant’s “choice” should not be based on an opportunistic selection made with a particular claim in mind. Instead, the choice should be determined by which law or laws the defendant has adopted at any time since just before the earliest event giving rise to the claim, or since some other earlier time. For example, a person who changes their law to recognize a new class of property or other rights that the person previously trampled on might open herself up to claims based on the new law for her past conduct back as far as the applicable statute of limitations reached. If so, anyone planning to change their adoption to recognize a new class of rights would take care to avoid infringing those rights for a sufficient period of time before such change. These two principles, combined as “Defendant’s Law of Greatest Liability” rule are a serviceable start. This rule creates disincentives for opportunistic adoption of lenient laws to escape liability for planned evil deeds. Some potential for unfairness or abuse remains, however. Under this rule, persons adopting more severe laws are vulnerable to being sued by those who have made themselves invulnerable, or less vulnerable, by adopting less severe laws. Allowing claimants to hold others to more severe standards than they hold themselves would create too much pressure for all to adopt laws of minimal or no liability. If all did so, the usefulness of the law for proscribing appropriate remedies for wrongs would be undermined, and the law’s ability to provide incentives for legal settlement instead of extra-legal direct retribution would be destroyed. Generally speaking, applying the “Defendant’s Law of Greatest Liability” and “No-Hypocrisy” rules together is almost logically equivalent to simply applying the law of least liability between plaintiff and defendant in any given circumstance, but not exactly so. For if the plaintiff’s “law of least liability” results in greater liability than the defendant’s “law of greatest liability,” then the defendant is held to the law of greatest liability adopted by defendant during the relevant time period, which may result in greater liability than some less severe law adopted by defendant during the relevant time. Nonetheless, except for the foregoing circumstance, it will usually be the case that the least severe law held by claimant or defendant during the relevant time period will be the law applied. It is therefore convenient if not completely accurate to refer to this system for resolving differences between laws as the “Rule of The Weakest Tool.” Each party to a dispute may bring “offensive” weapons, that is, laws that entitle the party to some form of legal relief, sometimes called “positive laws.” The claimant brings a claim based on some law adopted by the claimant, and the defendant will either have some some law covering the same issues, or will not recognize the legal right claimed by the other party entirely. Each party to the dispute may bring “defensive weapons,” sometimes called “affirmative defenses,” that provide exceptions to positive laws. 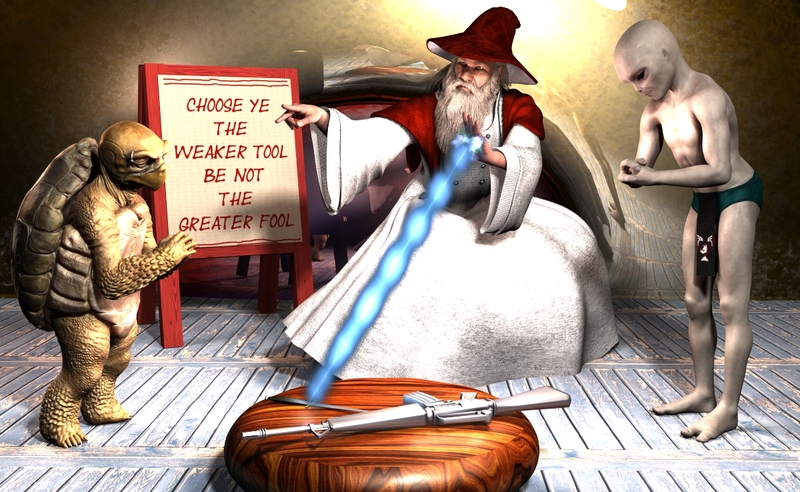 Under the Rule of the Weakest Tool, the jurist examines the positive laws and affirmative defenses brought to the conflict’s “weapons pool,” excluding all but defendant’s strongest positive law, claimant’s weakest positive law, defendant’s weakest affirmative defense, and claimant’s strongest affirmative defense from the pool. In many cases, the parties will not bring multiple weapons of the same type to a conflict. In such simpler, more typical cases, the jurist’s job is easier. There is less or nothing at all to exclude from the pool, which simply contains the applicable laws from each party. For positive law, the weaker law is the one that, when applied to the facts of the case, would result in the lesser liability for the defendant. For affirmative defenses, the weaker law is the one that results in greater liability for the defendant; that is, the weaker defensive law is the weaker shield. From the case’s “weapons pool” the jurist selects the weakest positive law, and the weakest affirmative defense, as the law of the case. Where the weaker of two laws is unclear at the outset of a case, the case may be tried under both laws and the weaker law identified after liability under both laws have been calculated. A refusal by the defendant to recognize the positive right claimed by the claimant will negate that right entirely, assuming that the refusal complies with “Defendant’s Law of Greatest Liability” and with the requirements for effective adoption of voluntary law. The refusal need not be expressly stated. It may be inferred from a silence of sufficient clarity on the right in question. For example, a statement that no property right can be attached to information of any kind is as effective as a law that recognizes rights to tangible property only and is completely silent on all other types of property right, when it comes to negation of intellectual property law claims. Under the Rule of the Weakest Tool, all parties have an incentive to adopt sufficiently severe laws to afford themselves reasonable remedies for infringement of the rights they care about. When people adopt laws that provide for reasonable penalties, they provide an incentive for those they have wronged to seek legal remedies instead of extra-legal remedies. Having stated the rule, some examples will help illustrate its operation. Suppose, for example, that Cain adopts a law in which there is little or no penalty for murder, and then murders Abel (who, like all of his family, has adopted a law with severe penalties for murder). In such case, Abel’s family can legally find no justice or satisfaction under Cain’s law. They may, however, extra-legally murder Cain in retribution, without putting themselves at any greater risk of legal liability than Cain. Anyone bringing a legal action on behalf of the slain Cain would be limited to the “law of least liability” adopted by Cain during the relevant period, which is the time from just before Cain murdered Abel until Cain was himself murdered by Abel’s avengers. It’s quite easy to see why Cain could not rationally expect that adopting an overly lenient law would be of any personal benefit in securing his own safety and happiness. Such would be true, unless by some extraordinary means Cain is immune from being murdered. Acquiring such immunity may be presumed impossible without the intervention of a state or similar evil. When an aggressor is practically immune to retribution (for example, by being “judgment proof”), the “impossibility problem” is at work. The impossibility problem primarily comes up in the context of property claims but not, in any practical sense, in the context of claims for bodily or personal harms. Impossibility of retribution may be a problem even for personal safety, where state or state-like (e.g., organized crime) powers grant practical immunity from extra-legal retribution. But this is a problem caused by state aggression; it is essentially a problem of dealing with outlaws, and is not a problem between people who follow the principles of voluntary law. The more interesting problem that exists more squarely within the context of voluntary law is that of differing property rights. In this area, voluntary law provides new and flexible solutions to age-old problems rooted in property claims. The impossibility problem is a present reality for claims based solely in property rights, for the simple reason that not everybody holds the same types of property. While virtually everybody has personal property of some kind, some may own no real property (e.g., land), or no “intellectual property.” Consider, for example, the case of copyright. Creators of books and so forth might prefer the ability to make claims against those who copy their works without permission. Some consumers of creative content, on the other hand, might generally favor no such penalties for copying the works of others. Under the principle of reciprocity, there is no way for a content creator to enforce a copyright claim against someone who refuses to adopt copyright law. The prior chapter pointed out how the publication requirement nonetheless provides the content creator with certain protections from those who refuse copyright laws, because voluntary law society members who reject copyright laws must identify themselves. Whether that outcome is good or bad, it provides an example of the impossibility problem at work. What about people who reject all real property claims, even personal property claims? Again, the publication requirement provides a check against insincere adoption of property laws. Suppose Willy the Wanderer adopts a law that rejects all real and personal property laws. Such a person is inviting theft – actually, such person does not recognize theft as a possibility. Willy therefore cannot be charged with trespass or theft, but neither can obtain protection of the law for any belongings that others may desire, and will be left only with things that nobody else wants. If you do not want Willy sleeping in your house, lock the door — he will be unable to acquire the tools to break and enter. If you find him sleeping in your unlocked garage, he cannot be charged with an offense under voluntary law. You might have to lure him out with the promise of a hot meal, and then secure the garage, if you please. If he defends his possession of the garage with force, he is breaking his own law, and if he threatens you in the process it may well excuse you from bodily harm to Willy caused by your actions in self-defense. If you evict him from the garage with force, you will be responsible only to the extent you have physically harmed his person in the process, without justifiable excuse. Is this balance of rights and obligations such a bad outcome? Does it not leave legal room for the the homeless to exist in the undefended spaces, with their personal dignity intact? Is it not in large part how the humane parts of the world work, anyway? This extreme hypothetical is actually fairly easy. Few people would go to the extreme of Willy the Wanderer in their choice of law, but the small minority who did would be free to wander at the risk only of their personal property. And most sensible wanderers would respect personal property rights, at least. The best law to be applied when an affirmative defense is raised is not quite so clear. Should the defendant be allowed to raise all the affirmative defenses allowed under the defendant’s law? Or should the defendant be limited to those affirmative defenses that are permitted under claimant’s law? As formulated above,the Rule of The Weaker Tool deprives defendants of their chosen affirmative defense, limiting them to the claimant’s affirmative defense if it is weaker than theirs. This apparent deprivation of the defendant’s voluntarily adopted law is not what it seems. The following example illustrates why. First, a little background. An affirmative defense is like an excuse that excuses defendants from responsibility for their actions. For example, self-defense or defense of others can be an affirmative defense to battery or murder. Necessity can be an affirmative defense to trespass. Many other affirmative defenses are possible. Affirmative defenses may be distinguished from positive laws on the basis of which party has control and responsibility for choosing and proving the elements of the action at hand. If the claimant is required to select and prove that all requirements are satisfied, the action is a claim under positive law. If this responsibility is on the person defending to escape liability for the claim, the action is an affirmative defense. It is evident that the distinction is procedural, suggesting this exact distinction may not always apply depending on the chosen procedural rules. Nonetheless, it should be fairly clear in almost every case whether or not a law is being used offensively as a basis for a claim, or to defend against the claim of another. The incentives will be the same regardless of hair-splitting over how best to arrive at the proper classification. Which law should determine the affirmative defenses to a claim, claimant’s or defendant’s? Let’s start with a couple of counter-examples based on the same rule as for positive laws: we shall suppose, for the sake of illustration, that defendant’s affirmative defense applies, unless applying claimant’s affirmative defense would result in less liability for defendant. Let’s see how this approach plays out in a couple of scenarios. Scenario A: Fanatic, who has adopted a law stating that any harm committed to prevent an imminent abortion is justified defense of others, hides in an abortion clinic and injures Sawzall, an abortion doctor, just as Dr. Sawzall is about to perform an abortion. The doctor seeks a legal remedy for the attack, and had previously adopted a law that does not recognize the defense of a fetus in cases where an abortion is elected by the mother. Fanatic raises his intended defense under the rule of defendant’s law for affirmative defenses, and the doctor is unable to recover for his injuries. Scenario B: Luckless owns no property of significant value and adopts a law permitting poverty as an affirmative defense against continuing trespass. He then takes up residence in Rich Brother’s spare vacation house. Rich, of course, has adopted a law that does not recognize poverty as an affirmative defense to trespass but does recognize defense of property as an affirmative defense against claims based on coercive removal. Rich Brother cannot legally evict or obtain any damages from Luckless, who successfully raises poverty as affirmative defense to the claim of trespass. This is so, even if Luckless recognizes Rich Brother’s underlying property claims. Under Luckless’ rule, poverty is a complete defense depriving the property owner of any legal remedy for the trespass. The result is the same as if Luckless had adopted a law that does not recognize rights in excess real property. Under the Rule of The Weakest Tool, Rich’s trespass claim would fail because his property right in the vacation home would not be recognized as valid under Luckless’s law. Either way, Rich has no legal remedy. Rich’s only option, apart from tolerating Luckless, is to physically remove Luckless extra-legally and plead the affirmative defense of defense of property in case Luckless brings a claim for damages based on the removal action. Rich can use any method he likes to carry out the extra-legal eviction, supposing he has adopted a law in which defense of property is a complete defense to any claim of excess force. So if Rich Brother shoots Luckless in both legs and throws him out the third-floor window, tough luck for Luckless. If Luckless were to sue for the violent removal, Rich Brother would obtain the benefit of both his positive property law and his affirmative defense, and escape all liability. The foregoing examples illustrate the problem of impossible problem at work, working obvious injustice and incentivizing predatory behavior. Fanatic will never perform an abortion and therefore has no concern about the fetal defense excuse ever being raised against a claim he might make. Luckless owns no property and likewise has no reason not to adopt poverty as an affirmative defense to claims based in property; conversely, Rich has no reason not to adopt defense of property as an absolute affirmative defense. For comparison, let’s see how the Rule of The Weaker Tool plays out in another scenario involving affirmative defenses. Scenario C: Assume Defender, who has adopted a law stating that any harm committed to prevent abusive injury to a child is justified defense of others, becomes aware that Abuser has imprisoned Abuser’s own children and is beating them bloody every day. Defendant executes a daring rescue, freeing the children, but unavoidably injuring Abuser and destroying part of his home in the process. Abuser seeks a legal remedy for the attack, having long adopted a law that does not recognize defense of others as an affirmative defense, in cases where person being defended against is a parent of those being defended. Under the Rule of The Weaker Tool applied to affirmative defenses, Defender therefore cannot raise his intended defense, and must compensate Abuser for his injuries and property damage. Meanwhile, assuming Defender recognizes the affirmative defense of self-defense, Defender cannot recover from Abuser for any injuries inflicted by Abuser in reasonable self-defense. This may not seem to be a very satisfactory result, but is not at all as bad as it seems. The hypothetical intentionally portrayed Abuser as unsympathetic to play with the reader’s emotions, to encourage clarity of thought. What if Defender mutilated everybody who so much as raised their voice to their children? Applying claimant’s rule of affirmative defense simply creates incentives for Defender to exercise care while rescuing children. Abuser may not deserve to be treated with care, but that is not the point. The point is that a legal system that permits Defender to effectively appoint herself judge, jury and executioner upon the general public will create an unbalanced and hazardous society. The law should certainly not prohibit Defender from her meritorious deeds in defense of others, but should also provide her with incentives to act with care while doing what she perceives as good. Of course, Abuser cannot claim a right to abuse anyone including his own children against their will under voluntary law, because such a law would clearly violate the principles of personhood and voluntaryness. Abuser may therefore be held fully liable under claims brought on behalf of his freed children. The issue is limited to whether Abuser may exploit the Impossibility Problem to deprive Defender of her affirmative defense, when she seeks to defend Abuser’s children. Suppose the Rule of The Weaker Tool still applies, and the tables are turned: Abuser attacks to defend Defender’s children (assuming Defender has become an abuser). Shall voluntary law permit Abuser to gain the benefit of Defender’s affirmative defense? The No-Hypocrisy Rule would say no. Because Abuser has adopted a law that would result in greater liability, Abuser cannot receive the benefit of Defender’s affirmative defense that would result in less liability, if sued by Defender. Abuser must be judged under the same affirmative defense that he would permit for those he makes claims against, unless doing so would permit the claimant to enjoy greater benefits than afforded by claimant’s own law on affirmative defense. In other words, when raising an affirmative defense, defendant must do so under claimant’s law, unless defendant’s own law provides a weaker affirmative defense than claimant’s. These examples illustrate how reciprocity, without hypocrisy, creates incentives for people to adopt laws of affirmative defenses that will not deprive them of a similar defense if ever needed. They illustrate the benefits of the Law of The Weaker Tool applied for affirmative defenses as well as positive laws, with the meaning of “weaker tool” suitably adjusted. This should prevent injustice and predation in personal injury cases, where impossibility of reciprocity is not a problem. In property cases, where impossibility of reciprocity is a common problem, the effects of the proposed rule should be examined. To that end, it is helpful to revisit Scenario ‘B’ discussed above: Luckless versus Rich Brother. Under the Rule of The Weaker Tool, if Rich Brother sues Luckless, who recognizes Rich Brother’s property right to his spare home but has adopted poverty as an affirmative defense, Luckless is limited to Rich Brother’s affirmative defenses which do not include poverty. Rich Brother can therefore obtain an order to legally evict Luckless from his vacation home. Unlike claims that are controlled by claimants, the defendants are in control of affirmative defenses. Thus, the Impossibility Problem coupled with applying Defendant’s Law for affirmative defenses would create incentives for using extra-legal remedies, without any risk of legal liability. This is problematic, to say the least. The power to select one’s own affirmative defenses cannot be allowed to create incentives for extra-legal remedies. If voluntary law creates incentives for extra-legal remedies, it will quickly lose legitimacy and cease to exist. The foregoing contrasting examples illustrate how the Rule of The Weaker Tool creates incentives for reasonable behavior. In the first hypothetical, Rich Brother could not evict Luckless even if both Rich Brother and Luckless had adopted laws recognizing property rights in vacation homes, because Luckless was entitled to his affirmative defense of property. Conversely, if Luckless had adopted a law that did not recognize Rich Brother’s positive property rights, Rich Brother would have had no incentive to perform the extra-legal eviction in a reasonable manner, because Rich would be entitled to his affirmative defense based in defense of property. The power to select one’s own affirmative defenses should not create incentives for extra-legal remedies or predatory conduct. Let us consider some more examples of property law conflict resolved under the Rule of The Weaker Tool. Suppose one person (Lysander) adopts a law that adverse possession requires open and unchallenged use for a continuous period of three years. Another person (Murray) adopts a law requiring only one year of open and unchallenged use. Murray openly squats unchallenged on Lysander’s land for 2 years, at which time Lysander sues to evict Murray. Murray countersues to claim Lysander’s title. Applying the Rule of The Weaker Tool to Lysander’s claim, Lysander wins, because adverse possession is an affirmative defense. Murray is therefore not entitled to his affirmative defense and must use Lysander’s more stringent standard, under which his adverse possession is not long enough to be effective. However, even if adverse possession could be advanced as a positive law by Murray, he also could not gain title under the the Rule of The Weaker Tool. Applying the Rule of The Weaker Tool to Murray’s claim, Lysander wins either way. Therefore, Lysander can legally evict Murray if Murray is relying solely on his affirmative defense of adverse possession, and Murray cannot obtain Lysander’s title. If Murray wishes to challenge Lysander’s title, he must find a different basis for doing so. For example, suppose Murray adopted a law that did not recognize any property claim to fallow land plots of one acre or more, that have gone unused for five years or longer. Lysander claims hundreds of acres of land, all wild and unused. Murray fences off five acres within Lysander’s claim and cultivates a farm, basing his right to do so on the positive right of property recognized by his law. Lysander takes notice and sues Murray for eviction. Lysander’s claim fails under the Rule of The Weakest Tool, because under Murray’s positive property law, Lysander does not have a legitimate claim to the land Murray has improved. Conversely, if Murray sues Lysander for title, Murray’s claim fails under the Rule of The Weaker Tool, because Lysander’s property law is weaker with respect to the property claim that Murray would enforce. That is, Lysander’s law is the weaker tool in the second context, because it results in less damage to Lysander property claim. Lysander therefore cannot legally evict Murray, but neither can Murray gain title that is superior to Lysander’s. Just as illustrated by some of the examples involving Rich Brother and Luckless, differences in substantive real property laws can result in stalemates wherein one party cannot legally evict and the other cannot gain superior title. Murray nonetheless retains an inferior claim which may be recognized so long as the five acres he has fenced off do not go unused for more than five continuous years. Such stalemates are a feature of voluntary law, not a bug. Although stalemates might sometime cause inconvenience, in the main they embody an organic balancing between inordinately large or inappropriate property claims by an elite few and the natural property rights expectations of the masses. Conflicts such as Lysander and Murray experienced do not happen in a vacuum. Such conflicts occur in a social context with different numbers of people adopting laws on different wavelengths of the property rights spectrum. The reasonableness of one’s stated position on property law will be judged within prevailing community attitudes, which although allowing for variation and ways of relieving tension between conflicting laws, will render outlying positions practically unenforceable. To illustrate, suppose Lysander appoints himself as sole supreme emperor and owner of the universe. By publicly adopting such a law, Lysander has accomplished nothing more than announce to the world that he is a fool not to be regarded seriously. He has adopted a law that by the Rule of The Weaker Tool renders unenforceable in every conceivable instance. The more grandiose a claim under voluntary law, the less enforceable it is. These examples illustrate a foreseeable side effect of voluntary law, including among other things the Publication requirement and conflict resolution such as the Rule of The Weakest Tool: a leveling of property rights or other rights claimed under law, due to pressure from the Impossibility Problem. Voluntary law under the Rule of The Weakest Tool, if widely adopted, may be expected to push enforceable property rights close to a minimum of what the vast majority of people deem acceptable. That minimum will tend to lie at the maximum of what the vast majority of people can realistically hope to own. It will become impossible under voluntary law for durable classes divided between property owners and non-owners to arise. Whenever great inequities arise, those who lack any realistic hope of acquiring a specific class of property will adapt by adopting laws that do not recognize the impossibly remote property claims of the elite. Under the defendant’s rule, the elitist property claims will thereby be rendered practically unenforceable. These examples only scratch the surface. Conflict of law is a complex and interesting area of voluntary law, with limitless possibilities flowing from simple principles under different circumstances. Some issues have not been addressed above, for example problems with determining the “weaker” tool when the remedies afforded by different laws are different in kind, i.e., of different types that are difficult to compare. Detailed discussion of such more advanced topics may be left for the future. The great jurists will be those able to cut through all the complexities of the different laws brought, and consistently do evident justice that respects and balances the respective choices of the parties. Rules such as the The Weaker Tool are not meant to be the final word, or to foreclose all debate on the question of just conflict resolution. The Rule of the Weaker Tool may, however, represent an idealized optimal solution to the problem of finding a fair and stable balance between the rights of claimant and defendant, within the confines of solutions that are not based on politically-drawn territorial boundaries and other impositions of laws without consideration for the personal choices of each party. Must the alternatives to resolving conflict of laws be limited to a choice of either defendant’s law or plaintiff’s law? What about some combination of plaintiff’s and defendant’s law, or choosing a third law? Other conceivable solutions, for example averaging of damages from different laws or random selection, would plainly fail to provide the same incentives for decent and reasonable behavior afforded by the rather straightforward Rule of The Weaker Tool. Certainly, parties to a particular dispute are always free to agree on some other way to resolve differences between laws they have adopted. In addition, the possibility of universal conflict of law rules does not preclude members of different voluntary law societies from adopting a common set of conflict of law rules different from the universal set. Where all parties to a dispute have previously adopted the same conflict of law rules, there is no need to use the universal set. If all parties to a dispute cannot agree to use the same conflict of law rules, the universal set provides the only option for resolving the dispute without forsaking voluntary law entirely. The universal set of conflict of law rules therefore needs to be neutral, fair and workable enough to gain widespread acceptance as the conflict resolution rule of last resort for any person who would live according to voluntary law. Variations in the universal set can be tolerated without too badly undermining voluntary law systems, to the extent such variations are confined to boundaries that are discernible and not easily disregarded. For example, dispute resolution services located on the Moon might apply different conflict of law rules than similar services on Earth. Such differences could exist without injecting an intolerable amount of uncertainty into inter-personal relations, so long as constraints on travel between the Moon and Earth (a) make it easy for Moon people to avoid contact with Earth people, and vice-versa, and (b) make the probable forum for resolving disputes between Moon people and Earth people, in any particular circumstance, fairly predictable. Without a substantial degree of separation between adjudication forums that apply different default conflict of law rules, the practical effect of adopting a particular set of voluntary laws may become much less predictable, undermining incentives for adopting them. In the absence of any conflict of law rules, the options for resolving conflicts in which the parties cannot agree on the law to be applied are limited to extra-legal remedies or appeal to a non-voluntaryist authority. Either of these options breaks the system, rendering voluntary law ineffective and inferior in this respect to authoritarian legal systems. More fundamentally, a house divided against itself cannot stand. Without generally accepted conflict of law principles, the decentralized, atomistic nature of voluntary law will lead to division. Difficult disagreements will arise over which laws to apply in disputes between members of different voluntary law societies. These differences may become every bit as bitter and divisive as political fights over moral preferences in statist institutions, and will tend to drive people with different beliefs apart instead of encouraging peaceful acceptance and commerce despite differences in world views. Only time will tell if or how universal conflict of laws will evolve in voluntary law, but one possibility is for majority communities of voluntary law societies to emerge holding to their own “almost-universal” conflict of law principals, with minority voluntary law societies either using minority conflict resolution rules, or isolated without any consensus conflict rules. At this nascent stage, nothing seems better suited for resolving conflicts between personally adopted laws than the Rule of The Weaker Tool. Nor is there any room for serious doubt. This Rule, if widely understood and adopted, is capable of facilitating commerce and mutual respect between people of different beliefs, without requiring that any person bow to authority higher than their own sincere moral lights. THAT is a most remarkable invention. → Can Enemies Agree to a Common Framework of Law?